Moist cinnamon-maple cupcakes, topped off with maple cream cheese frosting, bacon crumbles and a drizzle of pure maple syrup. Now you can have breakfast for dessert too! When I was visiting Julie over the weekend, we did two different cupcake tastings. It’s become a tradition to find sweet treats and sample them together. Not even just on our own excursions but with good friends. It’s a fun way to sample a variety of flavors without feeling super guilty. Plus, it’s fun to critique them and declare a winner or at least favorite. Though, sometimes there’s a tie and an obvious loser. No cupcakes are created equal. Some are obviously more moister than others or packed with more amazing flavors and sometimes even surprises. Oh the surprise fillings always kill me… in a good way. You slice in and find something unexpected and totally delicious. Always a win! On one of our recent cupcake tastings, we got to try a French toast cupcake. So, this is inspired after that. It was one of my favorite flavors of the weekend and definitely had to be recreated. 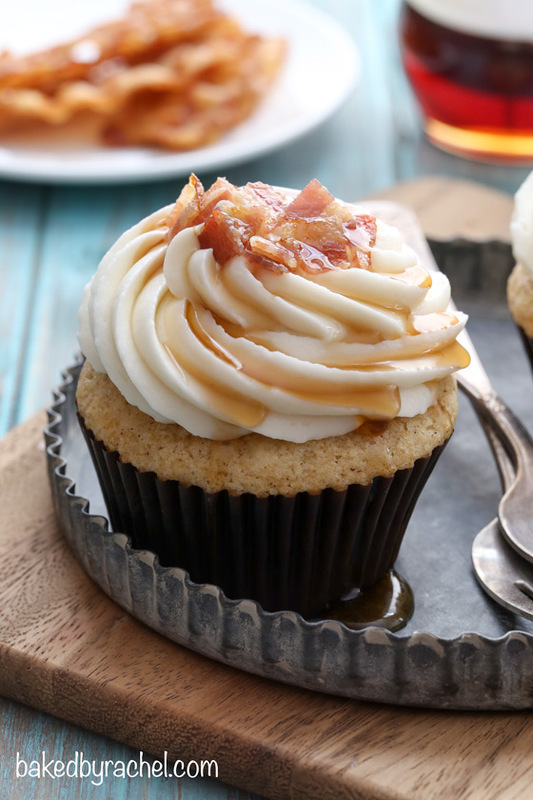 A moist cinnamon-maple cupcake, topped off with smooth maple cream cheese frosting, salty bacon crumbles and for the finishing touch… a drizzle of pure maple syrup. It’s a cupcake not to miss and a fun way to enjoy breakfast even for dessert! Even better, this recipe makes just 7 cupcakes. So, you won’t have a lot sitting around taunting you. And, it’s super easy to increase if you want to make more for a gathering! 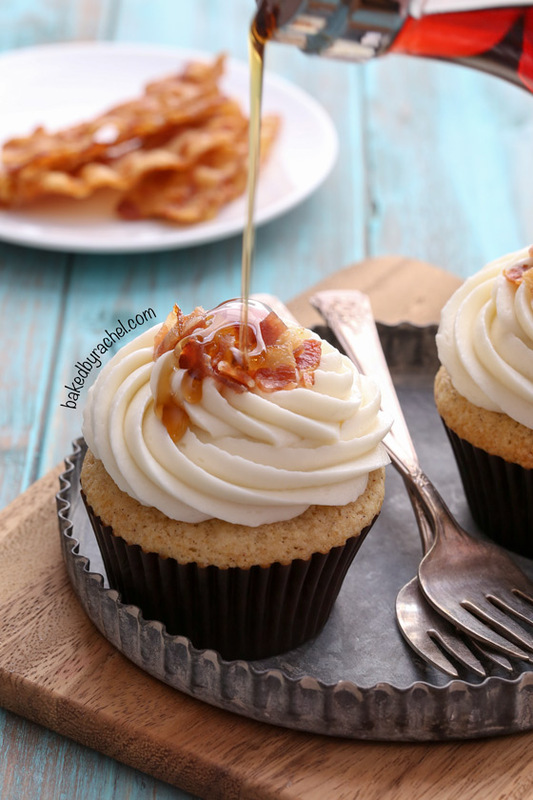 Be sure to add these fun and flavorful maple bacon French toast cupcakes to your baking plans! Moist cinnamon-maple cupcakes, topped off with maple cream cheese frosting, bacon crumbles and a drizzle of pure maple syrup. Preheat oven to 350°F. Line a cupcake tin with 7 liners. In a large bowl or stand mixer, cream together butter and sugar until light and fluffy. Mix in egg, maple syrup and vanilla. Scrape bowl as needed. Add dry ingredients, mixing until combined. With mixer running on low, slowly drizzle in milk, mixing until all ingredients are incorporated well and no streaks remain. Divide between prepared liners, using a large cookie scoop. Prepare bacon as desired. 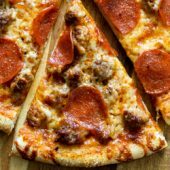 If baking, increase oven temperature to 400°F. Line a small baking pan with foil. Bake bacon for 12-15 minutes. Drain on paper towels and chop into small pieces. 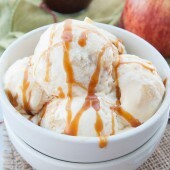 In a large bowl or stand mixer, beat together cream cheese and butter, followed by maple syrup. Add 1/2 cup powdered sugar at a time to cream cheese mixer. Beat until smooth and piping consistency is reached. Transfer to a large piping bag, fit with a piping tip. Frost cupcakes. Top off with bacon. When ready to serve, drizzle lightly with maple syrup. Love everything about this post!! That cupcake was definitely really good. I spy something we bought in Clifton at the gift shop ;) perfect prop! Oh my goodness – these sound crazy amazing! These just look divine!! An already perfect breakfast turned into an even more perfect cupcake!! FABULOUS! And the creativity is so noticeable with these. You’re amazing and such an artist! These cupcakes look crazy good! Several years ago I worked at a cupcake shop and we sold maple bacon cupcakes on Sundays. I always worked Sundays and it was so hard to resist them every weekend because they smelled and tasted so amazing. These look even BETTER and I can’t wait to try them! I am dying! These cupcakes are so amazing!!! Cupcake tasting sounds like the best way to spend the weekend! Esp with Julie! So glad you guys had fun, and these look positively fabulous! cupcakes tastings are the best!!! Sweet and salty is my favourite kind of flavour combination, so I can imagine I would LOVE these maple bacon french toast cupcakes. They look perfect & delicious! Just had a go at making these, and they turned out great! Thank you very much for the recipe. Being from UK I’ve had to check and convert the weights and measures and found that the icing was a little loose, so next time I will add more icing sugar (powdered sugar) to the mix, but overall the taste and finish is fantastic and I shall definitely be making these again. Looks delicious! I don’t think there is a better combination out there than maple and bacon. 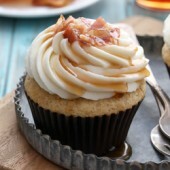 :) I’ve had maple bacon doughnuts, but never cupcakes, so I will be trying these soon! Thanks Elise. I hope you enjoy them! That drizzle of syrup just pushes these over the top! Brava! I made these for my husband last night and OMG they were so good!!! I think he almost proposed to me again LOL! Thanks so much for the recipe! And the portion size is perfect for just us. We hate making cupcakes and eating on them for days. Too many calories lol. Can you freeze these, Rachel? I haven’t personally tried. If you’re comfortable with freezing baked goods, it would be worth a shot. I wouldn’t recommend freezing with the frosting though. It would be best to frost fresh. 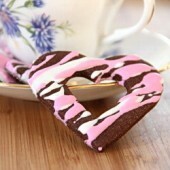 I am dying to make these. I’m positive they will be the best thing ever but my husband is skeptical and I love proving him wrong! But I only like to use Swiss meringue buttercream. Will these be good with maple smbc? I normally don’t comment on recipes, but I wanted to encourage everyone who is on the fence to make these! I made them exactly according the recipe (which I doubled), and they were so delicious! I baked for 22 minutes and they came out perfect. The frosting was divine, and the bacon brings it over the top. I dusted it with cinnamon as well as the maple drizzle, and they were gorgeous. Thank you so much for sharing such a delicious recipe! I made these today, and they are solid! 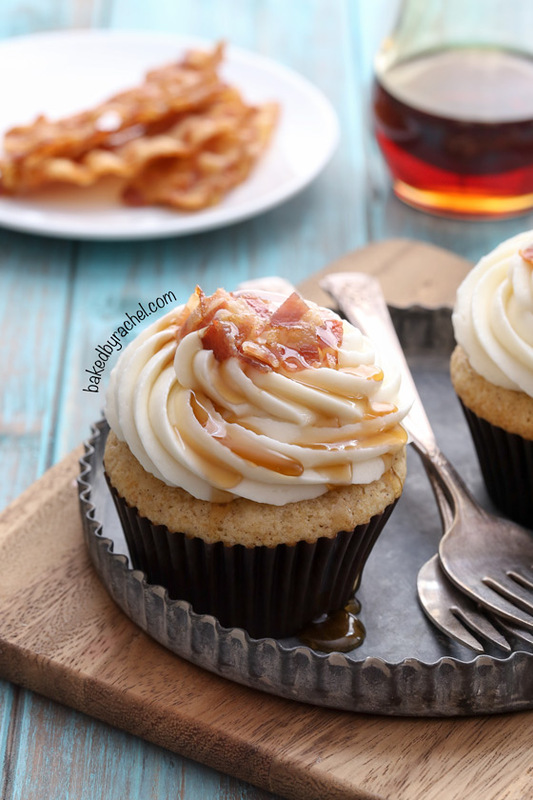 I searched high and low for a maple-bacon cupcake recipe, and after lots of research and comparisons, I felt this was >the< one, and I was right! With a few minor adjustments, this recipe yields a tender cake (the cinnamon is very subtle, and I feel like the cake tastes like a pancake more than french toast, but I think that's a good thing!) and lightly flavored icing. Baking your bacon with brown sugar brings this all together! I don't find pure maple syrup to be very flavorful, so I added a teaspoon of maple extract to the batter for an extra punch along with a couple tablespoons of light-brown sugar. I also found the batter to be a little runny at the end, so I added a couple tablespoons of flour. My double batch yielded a nice baker's dozen, which was perfect! I made a few adjustments to the icing as well—I ended up doing a 1:1 ratio of cream cheese and butter and once again added maple extract to the syrup. I would have actually preferred the icing to be a little thicker, but my end result was by no means a disappointment. Made these for a Women’s College Lacrosse tailgate in New England. They were a huge hit! Topped the cream cheese frosting with Niman Ranch Maple Bacon and Massachusetts Maple Syrup. Superb! Thank you! Hello! I was curious when the milk gets added in? Never mind! I am so sorry, I’m not wearing my glasses and missed the milk part, please dismiss my last question.